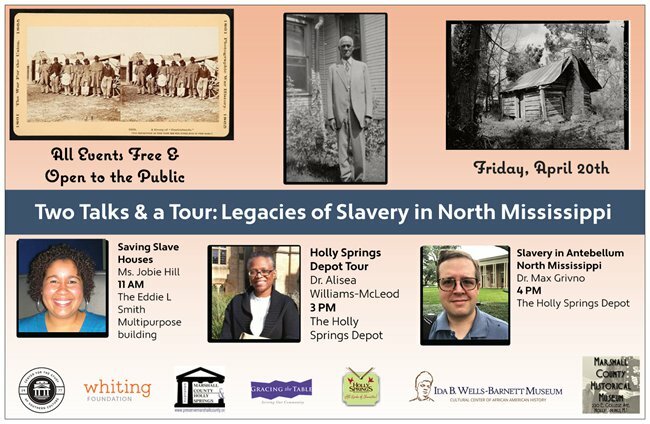 Preserve Marshall County & Holly Springs’s “Behind the Big House” Program returns for its seventh year, April 20 through 22nd, 2018, at the historic Hugh Craft House and adjacent slave quarters and kitchen in Holly Springs, Mississippi. This free event will offer visitors the complete antebellum story, with local and nationally-famous artisans, authors, historians and historic interpreters present throughout the weekend. Joining the event again this year is noted author and culinary historian, Michael Twitty (author of The Cooking Gene), who will be conducting his antebellum cooking demonstrations, and Joseph McGill, founder of The Slave Dwelling Project, who will be discussing the lives of the enslaved people who would have lived and worked on this site. Dr. Carolyn Freiwald, of the University of Mississippi Department of Sociology and Anthropology, will also be conducting an active excavation at the slave quarters. Local artisans, Dale DeBerry and Wayne Jones, meanwhile, will be giving talks about nineteenth-century brick making while historic interpreter Lois Harris will be demonstrating the role of an enslaved laundress during the antebellum era. Finally, Jobie Hill, historic preservationist and architect, will be discussing how to slave slave houses, Rust College Professor Alisea Williams-McLeod will be leading a Holly Springs Depot Tour, and University of Southern Mississippi history professor Max Grivno will talk about antebellum slavery in North Mississippi.